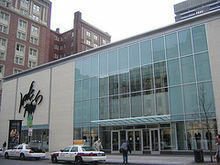 ** A surveillance tape from a Lord and Taylor department store reportedly captured video of a suspect placing the bomb package on the street. Authorities have video of a man in a black jacket on a cell phone, wearing a gray hoodie and a white baseball cap backwards. Investigators have arrested a suspect in the Boston Marathon bombing after reviewing photos and video from Monday’s event, a federal source confirmed to FoxNews.com. 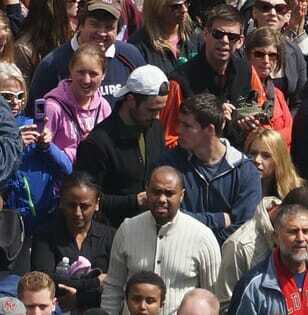 The suspect, who is expected to appear in federal court in Boston later today, has not yet been named by authorities. He was seen on surveillance footage that showed a young man carrying – and perhaps dropping – a black bag at the second bombing scene at the finish line of Monday’s race, where two bombs exploded, killing three and injuring 176. The camera at a Boylston Street Lord & Taylor directly across the street from one of the blasts, has given investigators clear video of the area, according to the unnamed official. Earlier, Fox News learned that the circuit board suspected of being used to detonate the at least one of the bomb has been recovered, and that FBI investigators continue to scan and analyze the cell phone tower records to identify positive hits for signs of calls that may have triggered both explosions remotely. UPDATE: Megyn Kelly on FOX News just said that no arrest has been made. UPDATE: Boston police tweeted there was no arrest. The man sought as a possible suspect is a white male, wearing white baseball cap on backwards, a gray hoodie and a black jacket, according to CBS News.